Today's So Shoe Me is the Evil Eye Slides, $69, by and available at Discount Universe. Eye love it , Eye love it , Eye love it! Set your sights on some slip on sequin sandals for a fashion forward take on lounge wear this fall. The retro 90s silhouette is right on the cusp of a full fledged comeback so scoop up these psychedelic hand sequined sandals before the masses catch on. Discount, the cult Australian brand, offers labor intensive sequin designs so you know you're getting a quality item made in socially responsible conditions. 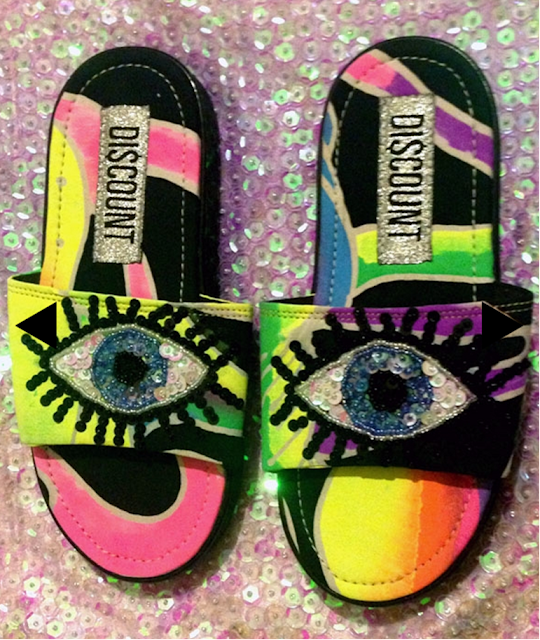 The Evil Eye is the perfect all-seeing embellishment to finish off these trippy tie dye sandals and the slip-on shape will add all-day comfort to any outfit. Pair these sparkling sequin sandals with some emoji cool leggings and a bright graphic tee for a kitschy twist on stoner style. So Shoe Me a pair of hand embellished sandals that will add a spark of high shine to favortie lazy day outfits.